Adjusting to a new culture! Adjusting to a new culture can be a time of experiencing new customs, values, and beliefs, as you are literally immersed in a new culture and possibly a new language as well. It can also be a time of confusion as you try to learn how to respond appropriately to cues that can seem foreign, and to “do the right thing” culturally. People may not respond the way they did back home, transportation is different, and you have to learn a variety of new things, from how to set up a bank account, to figuring out how to act at work. Many people dealing with these new stressors feel some anxiety, which is normal and has been called “culture shock“. The symptoms of culture shock will be different for each person, and can include feeling lonely or mildly depressed. Feeling stressed or irritable, and wanting to isolate from others are other common symptoms. You may feel overwhelmed trying to absorb all of the new aspects of living in this country. At times you may feel homesick and think longingly about your native country. You may even feel unsure of yourself as you try to figure out how things are done here. This is the wonderful “honeymoon phase” when everything looks wonderful and the newness of the new country is exciting and pleasant. You may feel excited about being here, and the new opportunities that are waiting for you. When you go to the stores and visit, you may be impressed by how big everything is, and by how things are done here. If people ask you questions, you will smile. Problems may start occurring because of language and communication difficulties, or because of differences between your native culture and those here in the United States. At this point, you may start to feel impatient, irritable, frustrated, anxious, sad, or discontent, and to think that this new country may not be so wonderful after all. Americans may seem abrupt, rude, or too different from the people from your native land, and our culture may seem a mass of new rules that are difficult to learn. You may also feel homesick for you home country. At this stage, you will begin to feel more “at home’ and able to get around, both physically, with the language, and emotionally. Things are starting to make sense now, and you don’t feel as lost or bewildered by the way things are done here. At this point many people start comparing their old culture with our new one, and deciding which practices seem better. You start to regain your sense of humor, and you may even laugh at some of the misunderstandings that you have had. At this point, you will have a better understanding of our culture and realize that it is neither all good or all bad. You also start to feel that you “belong here”. You will have accepted America as your home, and have learned to adjust to the differences in culture here. People progress through these stages at their own rate. Some will last longer than others, and you will respond uniquely based on your own personality and methods of coping with new experiences. 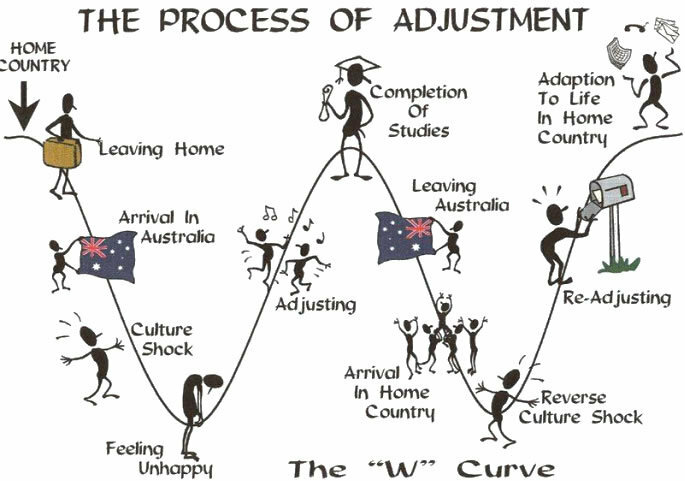 Interestingly enough, after going through all of these stages, if a person then goes back to live in their country of birth, they may go through a “re-entry shock” and need to go through them all over again! It’s important to be patient with yourself while adjusting to a new culture and to learn to utilize resources available to help you, whether a language class or local ethnic community group (which can give a refreshing language and culture break and help lessen loneliness as you adjust to our country). Realize that these feelings are normal. Everyone who comes to a new country and culture goes through them to some extent. Humor can help. Sometimes the differences between cultures, or situations that can come up, are humorous and can help with releasing some of your feelings as you adjust to new ways of doing things. Look at some of the differences between your expectations of your new country, and the reality. You may have thought Americans acted one way, or that our country was a certain way, and then found out that things are actually quite different here (see below, on “Culture”). Realizing that the two might be quite different can help with adjusting to the reality of life here. Try to put yourself in the other place. Imagine what it would be like for your new American friends if they were suddenly placed in your culture. This can help you be a little more open minded, and empathetic to the differences. Get involved with others: whether with a hobby, a team sport, or other activity, doing things with others will help you with both your English acquisition, and with the feelings of loneliness that can occur. Mutual interests are a great way to make new friends, so consider taking that art class, volunteering in a local community. Take good care of yourself by eating nutritiously and getting plenty of rest. Exercise, especially group sports or even walking with another person, can help with stress reduction and help ease some of the loneliness at the same time. Share how you feel with family or close friends. The support of others can help as you adjust to our culture and also grieve the loss of close contact with friends or family in your native land. Making new friends at work or school can also help with learning to accept your new culture and language. Set realistic goals for yourself, even if it’s learning the bus route to your work by the end of the week, or learning seven new words in English over the next five days. This can help build your confidence up as you see yourself reaching towards and achieving new things in your life.